I recently had the privilege of attending Charlie Weingroff’s seminar at Momentum Sports Physical Therapy in Lake Forest, CA. For those that don’t know Charlie, he is a really bright person, physical therapist, and strength coach. I actually first met him at the Perform Better Summit in Rhode Island in 2010, even though I have read most of his information prior. What I really like about Charlie is that he has some very similar philosophies as me in regards to how he trains athletes. 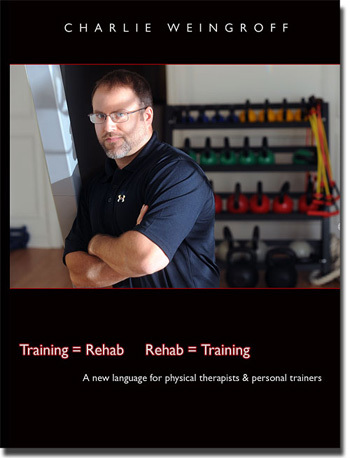 He is also does unbelievable job of blending strength and conditioning principles with his physical therapy knowledge. So, when he is giving a seminar 15 minutes away from my house, I am in. For me, writing these kind of posts allow me to go back and look at my notes from seminars and then organize them better by putting them out there. At the same time, these are my notes and may come across as random. -“Get it Right versus doing the best you can.” Charlie was very passionate about this thought. He doesn’t like hearing that people “Did the best you could”. Find out the best right way how to do something and do it. Doing the best you can isn’t acceptable. -The Making a Monster concept wasn’t what I thought it was going to be. I actually thought he was going to give us exercises, sets, and reps of how to make a monster. I was wrong. There is actually so much more to do before you prescribe sets and reps. It goes back to the first thought- Get it right. Dial in the athlete’s movement, preparation, and sensory systems before we assign sets and reps (which is probably the easy part). -Charlie touched upon aerobic energy system work. Aerobic energy system work can help the locomotor system. Charlie recommends aerobic work to be done in the 30-60 minute range at a heart rate below 110 bpm. Especially for those who may be in pain or in a rehabilitation setting. -“More Keys you have on the key ring, the more doors you can open”. I loved this quote. To me, there is nothing wrong with learning as much information that you can and then filtering the information and then developing and building your own system. For whatever reason, people in our industry criticize others for learning lots of new information and applying it. I somewhat agree and also somewhat disagree. I think that it is important that you are also being smart about how you incorporate new information. We need to be good at what we do. For example, I am a strength and conditioning coach. I want to be the best strength and conditioning coach for my athletes. Sometimes, we find those that learn new information in the form of a seminar or a book and try to apply it right away without having a foundation from what the knowledge is built upon. I am not a physical therapist, but I find that I can learn apply information learned from PT’s in my setting. However, I can’t and won’t treat pain, manipulate people (physically), or “practice” PT. Be good at what you do and what you are. – I really like what the omega wave technology does and could do for myself and my athletes. The reality is that it costs 35k. So, I won’t be purchasing one anytime soon. However, Charlie talked about using grip strength as a way to assess stress levels. From reading more information from guys like Patrick Ward and Charlie, finding a way to assess my athletes stress levels and then either ramping up or backing off on them MAY be something that I would consider doing. We will see as I need to experiment with it. 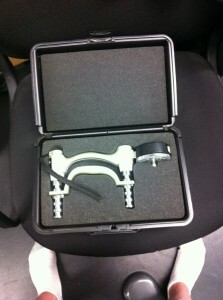 However, I just found a hand grip dynamometer in the Athletic Training room. Since it has a sticker on it that says it needs to be calibrated in 1999, it hasn’t been used in a long time. -Are we using our lumbar extensors when we should be using our hip extensors in exercises such as glute bridges? For me personally, I needed to see and feel this. As a coach who has been using glute bridges with my athletes for a few years now, maybe I need to re-look at this again. Why? Well, I need to work on my own hip extension pattern as I really don’t have much hip extension ability in my hips. However, Charlie was able to help me and give me a few correctives that I think work better than glute bridges in terms of re-learning how to use my glutes and hamstrings versus my lumbar extensors. 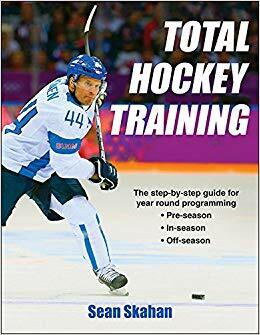 Maybe my athletes are using their lumbar extensors as well?I think hockey players could always use some more hip extension pattern length. -Rolling patterns should be assessed and corrected if they are impaired. This is something that I could see and feel directly. All in all, this seminar was really good. I actually had to miss the afternoon of the 1st day as my son Will had a playoff hockey game. I would recommend that you see Charlie at one of his seminars or at the Peform Better Summits this summit. Charlie will also be speaking at the Okanagan Strength and Conditioning Conference this summer. Great Stuff Sean. Any time you have a chance to spend time with Charlie, you are going to take away a few pearls that you can use. No question Tim. I hope your doing great! I see you off and on on the strengthcoach forums and happened to run across this article. Good stuff! Just curious, what alternatives to glute bridge did Charlie hook you up with? Side lying position- one hip in flexion while other hip extended. Ball Squeezes 8 Second Jumps, Core/Hip, 4-Day Off-Season, and Should We Strengthen Our Toe Flexors?